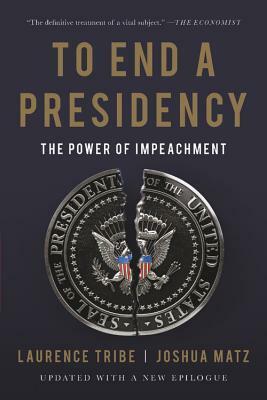 To End a Presidency is the definitive book on presidential impeachment and how it should be used today. Impeachment is our ultimate constitutional check against an out-of-control executive. But it is also a perilous and traumatic undertaking for the nation. In this authoritative examination, Laurence Tribe and Joshua Matz rise above the daily clamor to illuminate impeachment's proper role in our age of broken politics. Now revised with a new epilogue, To End a Presidency is an essential book for anyone seeking to understand how this fearsome power should be deployed. Laurence Tribe is the Carl M. Loeb University Professor and a professor of constitutional law at Harvard. One of America's foremost constitutional scholars, he is the coauthor of Uncertain Justice (with Joshua Matz) and numerous other books and articles. He lives in Brookline, Massachusetts.